Computers in modern cars tell you when the maintenance is due, but nobody knows when the gearbox is about to break. What if you car would inform you when it is going to need service so you could act before anything breaks? What if you car would tell you what to get fixed before its time for inspection? Well, it won´t be an if much longer. In traditional industry on the other hand, there is no good way of knowing how the biggest machines are used during their life circle. Machines are not connected anywhere directly which means that no real remote control is possible. If daily usage could be recorded, it would be much easier to know exactly when a certain part is near its lifespan and should be replaced. This would certainly save money, since the machine would not break because of an old or faulty part. Even if the big machinery in today´s IoT world would be connected directly to e.g. some cloud, the huge amount of data transfer would be immensely expensive. It would be cheaper to load the big data to memory sticks and transfer it by foot. But not, if a Capillary Network Platform is used. 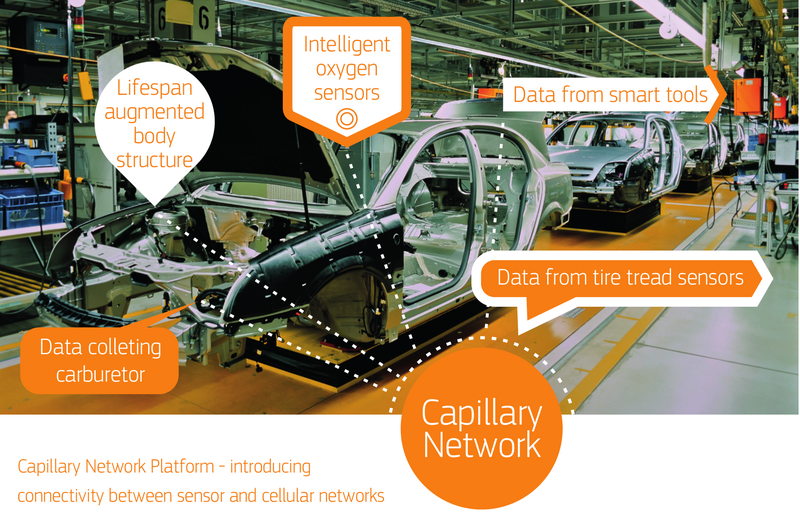 The Capillary Network Platform is a unique way to combine technologies. By doing that it offers possibilities to distributed computing. It differs from a normal IoT network by processing parts of data near its source and transferring only the necessary information. The Capillary Network Platform can guarantee a small delay between control and adjustment parameters, which is necessary in industrial automation. This way the service quality can be maintained even if some data processing is done. So far the data transfer has been seen as a “byte tube” where information is only moved from A to B. Now, with Capillary Network Platform processing can be done in the net, near its source. Thus, it is only up to us, how to exploit this ground breaking technology.